Jumper, boiler suit, utilitarian, workwear; whatever name you give this darling of spring fashion, it all adds up to stylish fun. These one piece wonders are a chic way to dress up or dress down, depending on the fabric and style of the one you choose. A chic cousin to the summery shorts version, the romper, this is such a fresh way to dress for spring. Whether buttoned up or zippered, remember it is a one piece look, so be fierce and fabulous, but don't wear it on an airplane! Here are a few of my favorites for the new season. G. Label Julian Workwear Jumpsuit. Image courtesy of goop. Gwyneth Paltrow recently wore the Julian Workwear Jumpsuit from her own G. Label on her Instagram and well, be still my heart. From the cropped legs to the wide belt, this jumpsuit has all the elements of perfect style. Wear it to work with a bootie or chunky heel, then pop on some flats for errands or don't change a thing and hit the town. The green is spot on for spring and the details are perfection. Adelyn Jumpsuit. Image courtesy of Anthropologie. Everyone needs that one unexpected, "not my usual" kind of look. This marigold colored Adelyn Jumpsuit from Anthropologie has a pack a punch color and beautiful detailed edging on the wide leg cuffs. You can buy it in a denim blue as well but why not go for the gold? 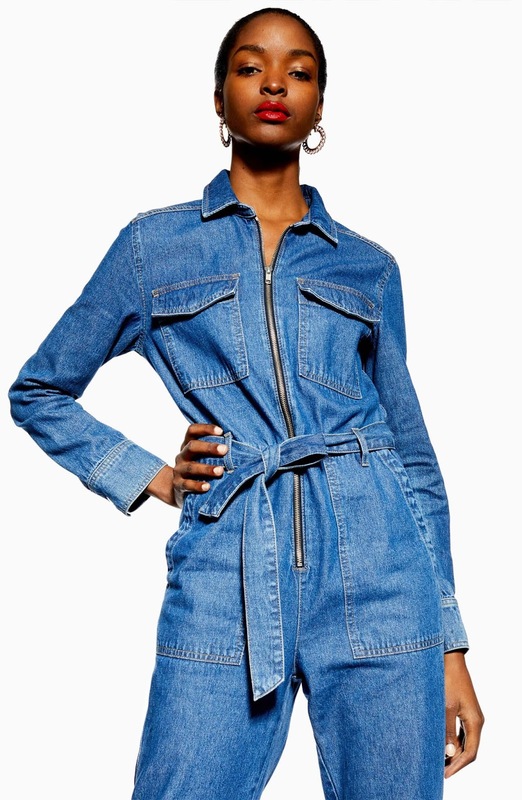 Speaking of cool ladies, my Vanguard Seattle Editor Sarah Caples Noble wore this Topshop Denim Utility Boilersuit out to The Neptune Theatre when we saw Isaac Mizrahi on his book tour last week. The denim version has its own matching tie belt over the zip front, which lends a low key feminine vibe in perfect contrast to the denim material. She looked so amazing it in. I own the green Topshop Mekan Utility Boilersuit, which has more of a cropped leg and no belt, so I added my own. Leone Belted Silk Jumpsuit. Image courtesy of DVF. 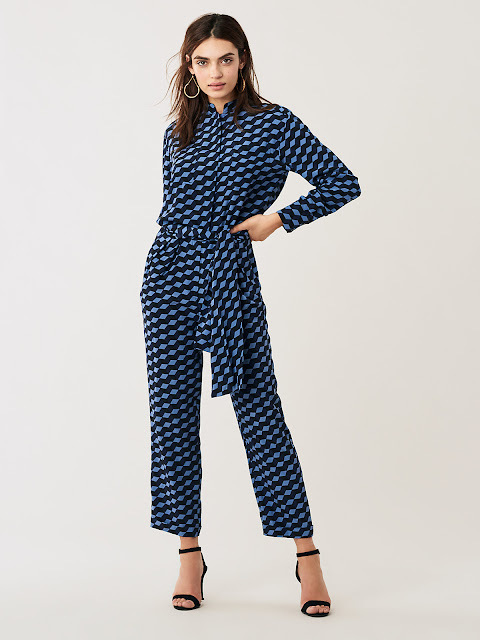 I can spot a fabulous DVF print a mile away, and this Leone Silk Jumpsuit is the stunning version of utilitarian style. The cubist print is modern and the whole look is silky and slinky like only DVF can do. Whether it is an evening work event, a wedding or a dinner out, you will be the talk of the event. Wearing strappy sandals or heels of any height will elevate the look further. Belted Puff Sleeve Denim Jumpsuit. Image courtesy of & Other Stories. I adore the puff sleeve on this off-white denim jumpsuit from & Other Stories. It"s playful air makes it a great look for a spring soirée. Whether you wear it with a neutral open toe or a colorful sandal, this jumper is super flattering. I think it would be gorgeous with turquoise or tortoiseshell jewelry and a woven handbag inside a clear bag like this Madison West one. ASOS Design Tropical Print Boiler Suit. Image courtesy of ASOS. ASOS is a great source for finding of the moment, and this tropical print boiler suit by ASOS Design has vacation written all over it. I like how they styled it, edged up a bit with black sneakers, but it would just as fabulous with a wedge sandal or your favorite flip flops. It's a workwear piece without the work. One and done. 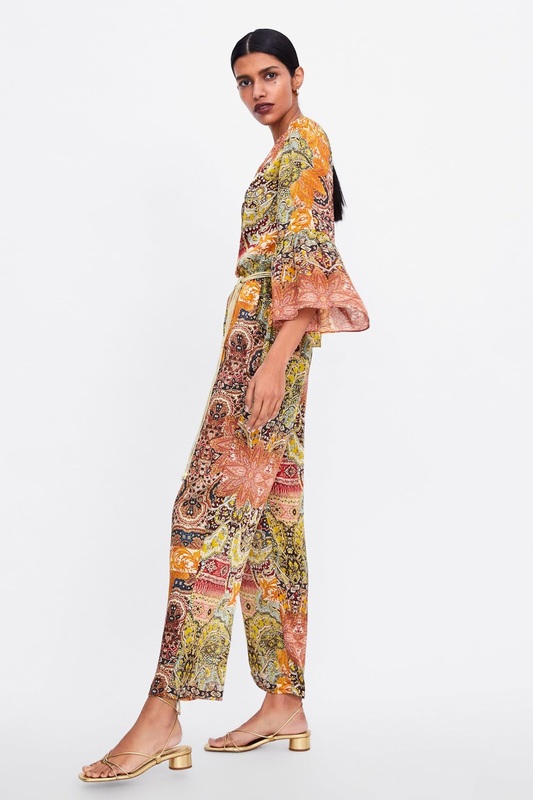 The scarf print is a beautiful trend for this season, and paired with a jumpsuit you have a match made in heaven, This elegant Zara Printed Belted Jumpsuit in a multicolored paisley print has gorgeous details like a summery woven belt and flutter sleeves that make it unique. And it is under $70! Mira Mikati Floral Embroidered Boiler Suit. Image courtesy of Farfetch. 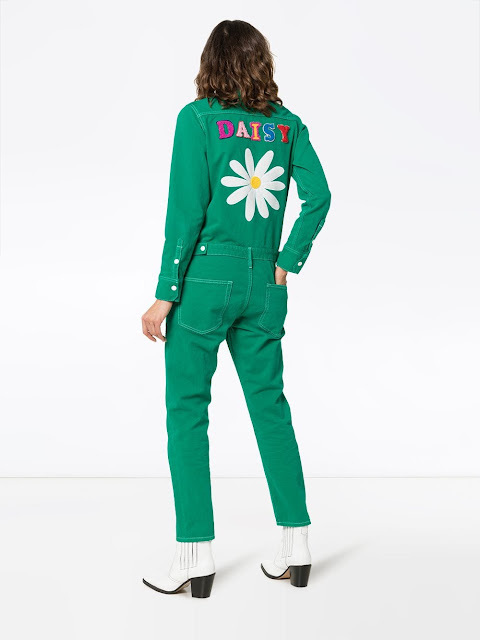 Last, but not least, the Mira Mikati floral embroidery cotton boiler suit, featured also at the top of this post. Green in all its shades is prominent this spring and summer and this one does not disappoint. This designer always has a whimsical feel that doesn't lose its chic style in the process. The straight cropped legs, white stitching and embroidery details make it a stand out piece. These jumpsuits, boiler suits and utility wear are a fun twist on wearing pants or a dress. They are super versatile, depending on how you style them. A white bootie will always make a statement, or if you prefer, a white heeled slide, Toss on some heels for a night out or wear a favorite pair of sneakers to dress down a bit. Whatever style you decide to try, I can guarantee you will be back for more. These comfortable chic pieces are addicting. Let me know what you love the most!